Students in the Institute for Responsible Citizenship learn how to solve real-world problems by doing for others. 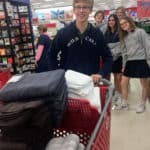 Most recently, Tatum Howard, Rachel Wilbourn, and Taylor Dworkin wrote a grant request to The Rainbow Fund at the Janet Jones Company to fund the purchase of several towel sets to help Veterans get a fresh start in their new homes after leaving St. Francis House. 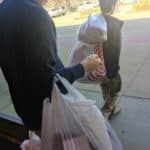 With other students in the class, they researched the needs of Veterans experiencing homelessness and found that they often struggle to set up new living quarters after being homeless. 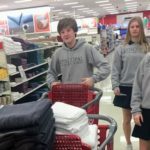 This group purchased 25 new towel sets from Target, including large bath towels and hand towels. Real world skills to help with real-world problems. St. Francis House is grateful for the support and so excited to be a part of supporting tomorrows’ social justice leaders!